Are you a beginner in Electronics wondering where to start? Well, weâ€™ve all been there once like you, swimming on the shores not knowing where to go and wondering, â€œWhatâ€™s the difference between resistance and capacitance?â€ or â€œWho is Georg Simon Ohm and why does he have a law?â€Â Â In this article, we are reviewing an awesome electronic component kit from ProTechTrader, which caters to all beginners and enthusiast looking to get started in the exciting arena that learning electronics has to offer. You may have noticed that this component pack from ProTechTrader is designed to follow the current best-selling electronics book for beginners, Make: Electronics: Learning Through Discovery (2nd Edition) written by the famous author Charles Platt.Â If youâ€™re not familiar with the Make: Electronics book, you should be as it is widely accepted as a go to learning tool for anyone interested in the field of electronics.Â The book, combined with the ProTechTrader Component Kit will allow anyone to easily and quickly dive into making working circuits while understanding the ins and outs of how they function.Â This component kit, is the first in a series and is packed with all the essential components necessary to complete experiments 1-11, which are covered in the first two chapters in the latest release of Make: Electronics 2nd Edition, Learning Through Discovery book.Â Additional kits containing the electronics needed for the next chapters of Make: Electronics will be released later this month. Letâ€™s take a look at the ProTechTrader Make Electronics Component Kit 1Â (Direct Link) and get an idea of the components inside this beginner friendly pack.Â This kit comes in two varieties to choose from including a Regular and Deluxe pack, the differences of each are explained below. 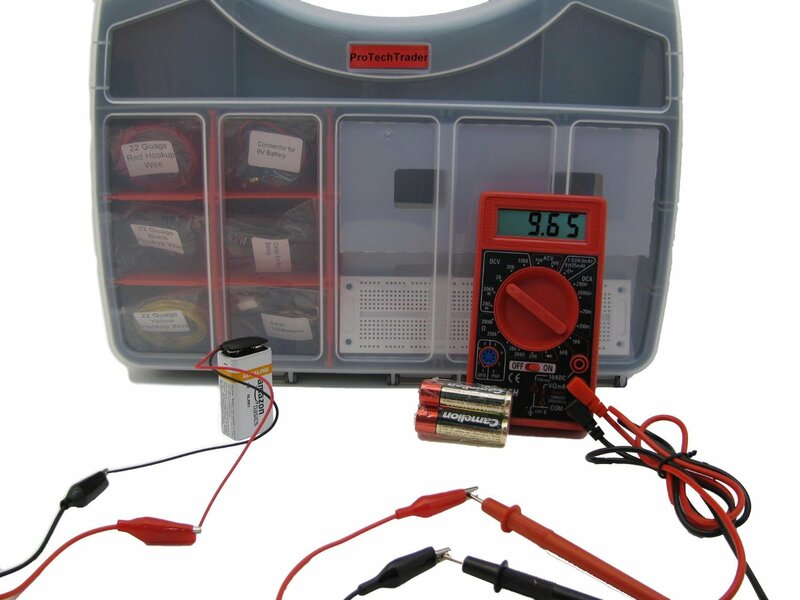 The Deluxe Pack, which is currently a $20 upgrade over the regular pack includes a basic digital multimeter, a 9 volt battery, and 1.5 volt alkaline batteries to be used in electronic experiments along with all of the items offered in Regular Pack that we previously mentioned.Â Both the Regular Component Pack and the Deluxe Pack come in a handy double sided storage case which allows for easy organization of your components and circuits along with added protection to keep them safe. Earlier we published a review ofÂ Best Books on Electronics for Beginners, and in that review article we covered the 1st edition of this book by Charles Platt.Â If you are a beginner looking to power up your learning curve, then we suggest you buy the new 2nd Edition of Make: Electronics by Charles Platt and the ProTechTrader component kit 1 to get started quickly.Â Platt provides you with new knowledge as you learn the fundamental concepts of the electronics realm along with the intriguing historical knowledge behind each fascinating new discovery.Â But reading alone will not give you a proper electronics understanding. You gotta get your hands dirty by taking things apart to see how they work and implementing these new electrical concepts that are introduced. This is where the ProTechTrader Make Electronics Component Kit 1 comes in handy, as you get all necessary components for experiments 1-11 in a single order. Otherwise, it would be a tediously tough job to hunt down all the needed components from chapters 1 and 2 and order them separately. Also ordering small quantities of electronic components is not allowed by many suppliers as they are usually sold in bulk so even finding some of these components can be a tough task and on top of that you may end up adding extra shipping costs several times as you have to order from different sellers to procure all essential components and letâ€™s not forget about the time spent waiting for them all to arrive.Â The fact that ProTechTrader has individually bagged and tagged each component with labels to identify them is another thing we love about this kit as it will allow you to focus more on learning and creating fun and exciting experiments as opposed to finding and identifying the parts needed.Â This is a well thought out kit will save you valuable time with quality parts that will give any beginner the motivational jumpstart they need to surge through the powerful world of learning electronics.